If you choose to output a Word document file from your SPSS data, you have no graphic options to set because both text and graphics are included in one output file. The options you can choose from are shown here: whether to include all layers of any tables that may be in the output, whether to include footnotes and captions, and how models are to be handled. The choices you have in producing a Word ­document. 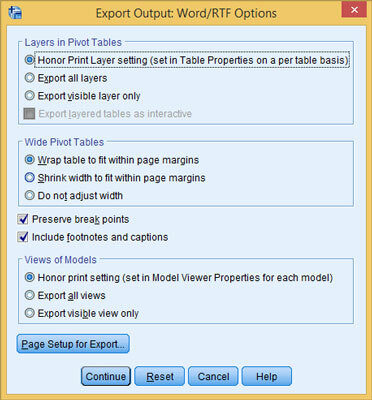 The Page Setup for Export button opens a dialog box that allows you to lay out the page size and margins of the output. It makes it possible to specify wrapping and shrinking to make things fit. When you want to produce output, click Continue in the Export Output dialog box, and the file is generated. Then you can load the output file directly into Word, as shown here. SPSS output as a Word/RTF file. 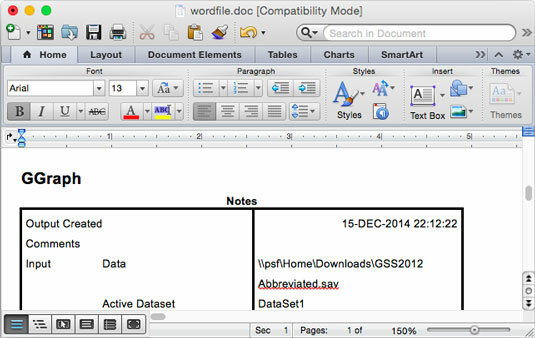 In this example, the output filename is wordfile, so the output file was named wordfile.doc. If the output file is in rich text format (RTF), it can be loaded and used by most word processors, including OpenOffice, StarOffice, and WordPerfect.